JeQuan Lewis leads VCU with 13.3 points per game this season and is the only Ram averaging double-digits thus far. It was a tale of two halves for the Rams in yesterday’s Battle 4 Atlantis loss to the 20th-ranked Baylor Bears, but ultimately a story the lacked a happy ending. The Rams looked sharp the first 20 minutes of the game, taking an eight-point lead into halftime, only to see it all vanish in a second half where the Rams were outscored by 16 points, the end result a disappointing 71-63 VCU loss. The Rams will have little time to sulk however, as Battle 4 Atlantis action continues today with a consolation path that starts tonight against the Red Storm of St. John’s. After a brutal 8-24 season under first-year head coach Chris Mullin (yes, that Chris Mullin…Dream Team Chris Mullin, shoot the leather off the ball Chris Mullin), the Red Storm will hope to turn things around with one of the country’s least experienced teams. St. John’s brings just one senior into this season (rarely-used Darien Williams) and is looking for the long-term rebuild by relying heavily on talented freshmen Shamorie Ponds (ESPN No.36 in 2016 class) and Marcus LoVett Jr. (ESPN 4-star redshirt freshman). The duo have combined to average just under 40 points per contest and are joined by a slew of sophomores that hope to eventually return SJU to respectability. The Red Storm are off to a 2-2 start with easy wins over the likes of Binghamton and Bethune Cookman followed by back-to-back losses to Minnesota and Michigan State. Through four games St. John’s has relied heavily on the three-ball, connecting on a scary-good 42.3% of their attempts from distance. They have however needed every bit of that three-point production thanks to a two-point offense that has been one of the worst in the country thus far, connecting on just 42.3% of their attempts. Defensively St. John’s has been solid, checking in at 62nd nationally in adjusted defensive efficiency thanks to a two-point D that has been relatively stingy. They’ll need to be very solid in that department today against a VCU team that loves to pound the ball down low. Yesterday was the perfect snapshot of VCU in that it showed the Dr. Jeckyll and Mr. Hyde personality of this year’s team this early in the season. The first half demonstrated just how good defensively VCU can be, which, when combined with a few made threes, had VCU looking like a team capable of a very deep March run. The Rams hit over 58% of their first half attempts against a HUGE Baylor Bears squad as well as three of their six three-point attempts. But as if a switch was hit in the locker room, the Rams looked completely different in the second half. The black and gold showed an anemic offense in the second stanza, hitting just eight second half field goals for 34.8% shooting in that half to ultimately do VCU in. Outside of a high foul count that in many ways decided the game (VCU was outscored by 13 at the stripe, a deciding factor in the 8-point loss), VCU’s defense was fairly effective throughout the evening. 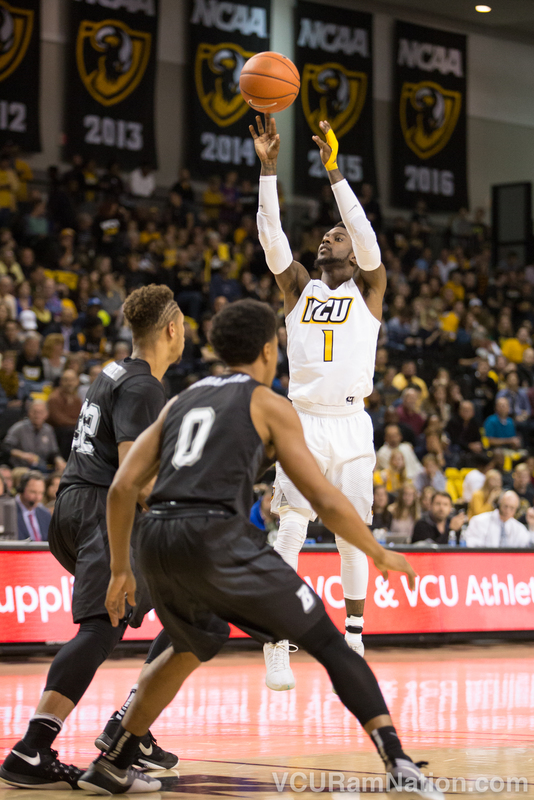 But the Rams’ inability to consistently put the ball in the hoop throughout the evening meant VCU needed a special evening on defense, something they just weren’t able to get with an officiating crew that seemed eager to effect yesterday’s action. On the season VCU’s numbers are solid, the biggest areas in need of improvement however being VCU’s turnover offense that currently ranks a depressing 303rd nationally (out of 351 teams) and a defense that has been prone to drawing whistles. After a solid start to the season, senior Mo Alie-Cox has combined for just six points and five total rebounds over VCU’s last two contests. Look for that to change today against St. John’s. VCU has been their own worst enemy at times this season (starting with the exhibition game) and can get off to an ugly 0-2 start in the Bahamas if the turnover and foul issues rear their head again tonight. That’s your starting point, don’t beat yourself. St. John’s has done a good job at not turning the ball over this season so if VCU can win the turnover battle that’s likely a very good sign. Add in some offensive help from folks beyond the usual suspects — and not just that, get THE usual suspects, Mo Alie-Cox and Justin Tillman going — and on paper VCU should win this game. The Red Storm on paper face the toughest D they will have seen so far this season when taking on VCU today. A two-point performance like they’ve become accustomed to (42.3%) simply won’t get it done against a VCU team that currently ranks in the top-25 in scoring D. A rock fight likely favors the Rams so to avoid the last-place B4A game the Red Storm need to be more than just two gun-slinging freshman and will also likely need another high-turnover night from the Rams to pull out the W.
Kenpom: 77-69 VCU win with a 74% chance of a Rams victory.